Every day two environmental presentations. They are agile, fast, playful, friendly, kind with humans and very, very intelligent. 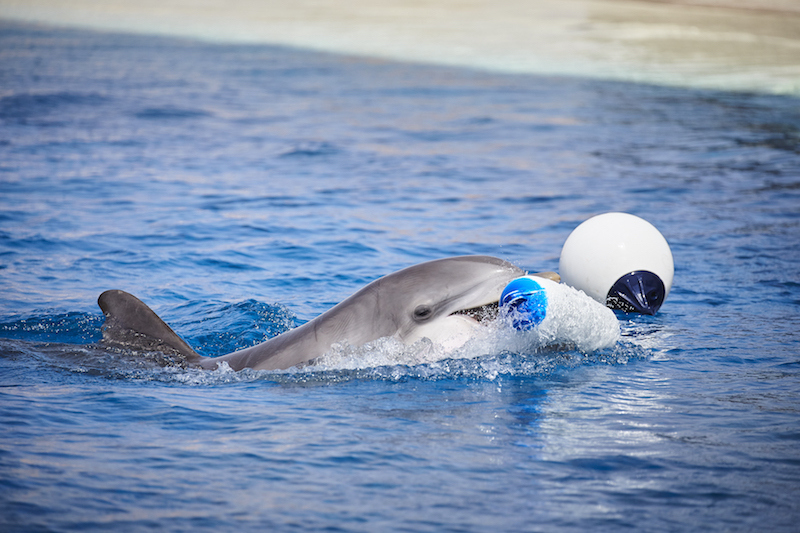 The four dolphins that enjoy the new installations built at Rancho Texas Lanzarote Park are just like this. Dolphins are cetaceans, mammals that are completely adapted to aquatic life. Cetaceans are divided into some eighty species, mostly all marine species, except five that are freshwater dolphins. Whales, sperm whales, humpback whales, porpoises, belugas, beaked whales, narwhales and dolphins, including killer whales, are all cetaceans. There are over 30 species of dolphins, the most common and best known for its sociable nature is the bottlenose dolphin (Tursiops truncatus), also considered one of the most intelligent animals on the planet. Biologists recognize two bottlenose dolphin ecotypes: offshore and costal. Offshore dolphins are adapted for cooler and deeper waters, and live in groups of up to 500. Costal dolphins stay in warmer waters around the coasts and live in groups of around 14. 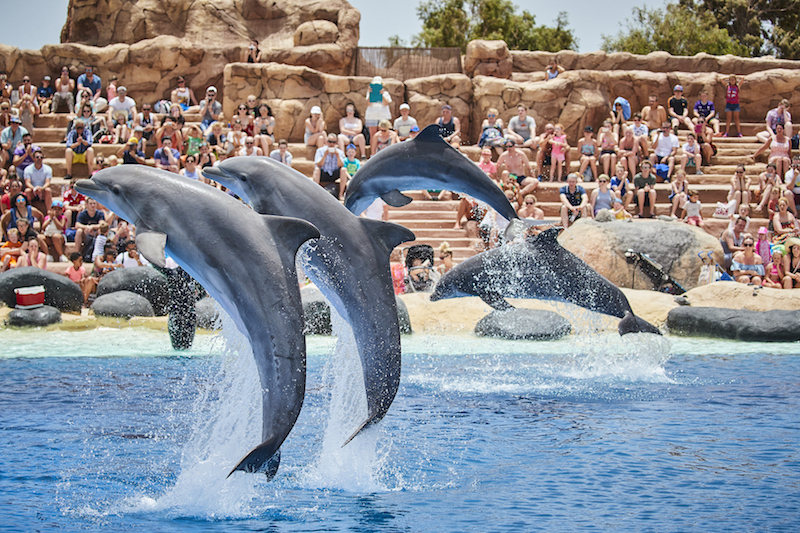 The dolphins at Rancho Texas Lanzarote Park are costal and are what scientists like to call > or Tursiops truncatus truncatus. Recent genetic studies have demonstrated that, like the rest of cetaceans, dolphins are related to the artiodactyla, with their closes living relative being the hippopotamus. They branched off about 50 million years ago. Bottlenose dolphins inhabit warm and temperate seas around the world. They can be found in every ocean except the Arctic and Antarctic. They have a fusiform body that is adapted for swimming faster. They use their tail fins called flukes to propel themselves, whilst the two pectoral fins and their dorsal fin is used for steering. They have an organ in their heads called a melon that they use for echolocation, this helps them study the environment around them. Dolphins don’t have a nose and it’s believed that their sense of smell is very limited or inexistent. 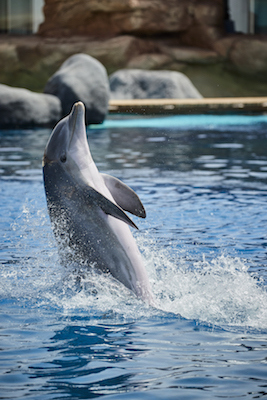 Their blowhole, which is situated at the top of their head is used for breathing. They can hold their breath for up to twenty minutes but prefer to breathe every five to eight minutes. On average, full-grown males are slightly longer than females, with the males at around 2,70 metres and the females around 2,50 metres, some have been found to measure nearly 4 metres and weighing up to 500 kilograms. Other than the deterioration of the sea and ocean, the greatest danger to dolphins and cetaceans is being caught in fishing nets and dying from suffocation.